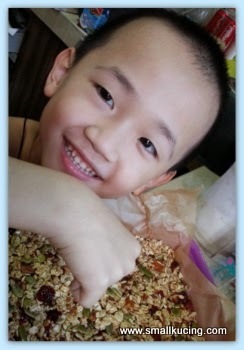 Ever since Mommy Ling gave Mamarazzi a taste of the Granola Bars that she made, Mamarazzi had wanted to try making it. 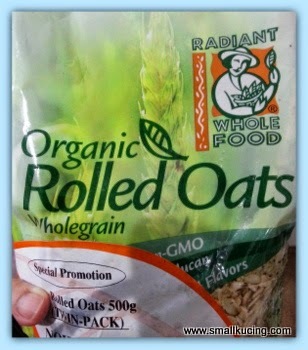 Found Jaya Grocer giving having offer of Organic Rolled Oats. Two packets for RM13 plus only. Cheap. as instructed...toast the seeds and nuts a bit...Then mix in the dried fruit and the caramised brown sugar, honey and butter. Put into a flat container and press it....follow by chilling it in the fridge for about half an hour. 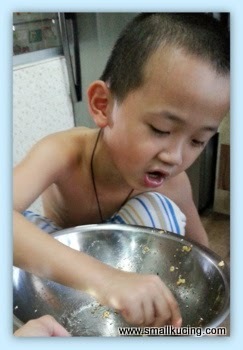 Meantime.....I become a bird and pick up all the strayed seed from the bowl and eat lo....mmm...nice. The end product....Mamarazzi still need to learn how to "cut" the thing properly la...Looks a bit ugly but edible. One for me...one for Mamarazzi...two for me...one for Mamarazzi..... good ah my Maths. After that, mamarazzi tried using Almonds to make...i didn't like it coz too hard. Not sweet enough. 1. 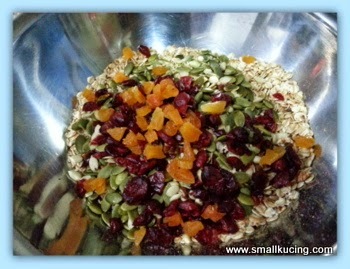 Toast the oats, seeds and nuts separately in a pan/wok or whatever you are using till fragrant. Separately ah....don't toast together al else will have unsightly black crumbs. Mamarazzi's sesame hangus-ed! Coz it's smaller size than the rest mah. Put aside. 2. Then add butter, honey, brown sugar and salt. Cook until bubbling and then continue to cook for 2 minutes. Remove from heat and stir in vanilla; which Mamarazzi forgot. Pour over oat mixture and stir well until evenly coated. 3. No suitable baking pan so mamarazzi used a Tupperware container. Put baking paper in it and pour the mixture in. She hates to get her fingers sticky so she used the senduk nasi (what do you call that in English ah?) to press the mixture to make it firm. 4. Sumbat into the fridge for 30 mins or in her case till she recall about it. Took the whole thing up from the Tupperware container and cut withe a serrated knife. Haiz....Lesen lembu hence the edges looks so ugly. Can be store at room temperature but she wrapped each in clinging wrap and stuffed into fridge. Easier to take and eat. Idea from Mommy Ling. Ahem....as usual.... please hop over to her blog from a proper recipe and method. I am impressed! In the 1970's I used to make my own granola. It was all the rage then, hippies did granola, tie dying, and macrame. But I only made the granola, you went several steps further by doing the pan and cutting. Wish I could taste it. Shape does not matter, only taste! Small kucing now knows how to make a lot of food liao. Good boy! Oohh, I saw this in your FB and you asked me to try to make it.. Looks simple, but I don't have all the ingredients ready.. I like the caramel (sugar, butter).. If I make, I will pour EXTRA caramel on the bars, haha..
Am bookmarking this.. 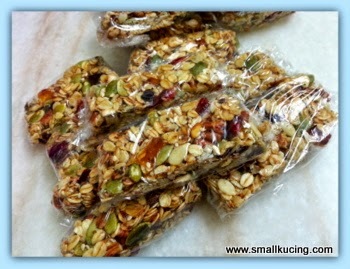 Ingredients look simple, easy to make.. Just have to make effort to go buy the ingredients like dried fruits and nuts..
Hah..hah...hah...your recipe pun macam comedy :D I like this granola bars. This weekend I want to make! Hahahh...thanks for the big shout out. Glad you all like it.Next time I think need to use a ruler. oh, NICE NICE NICE!! i just love all these oats, nuts and fruits thing!! RM13 for two 500g or organic rolled oats ah?? eih, that's cheap, i want to go and buy those.. i eat oats for breakfast mah, the ones i bought are RM7.50 for 500g, so this one is cheaper hor?? but is this instant oats ah?? i mean, tambah hot water can eat already, no need to cook?? loaded with oats, pecan nuts, pumpkin seeds, melon seeds, sesame seeds, cranberries, apricots and raisin!! 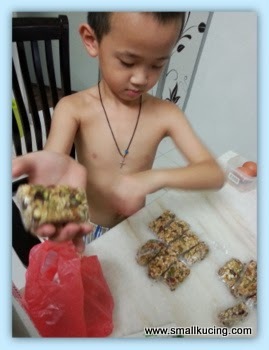 wow, that sure can be some energy bar also, i am sure Auntie Lina will also like them, because she always mengepaw "bird food" for breakfast also!! Uncle SK also want to try to make this, sedap lah, and easy to do also!! must follow Mamarazzi's recipe, but can omit the butter, brown sugar and vanilla essence or not?? just honey and pinch of salt will do kan?? Yea lo....easy to make leh...just kacau everytghing together then kau tim liao. Excellent but there seems lots of pricey ingredients for this bars. not realley leh. Just need to get all the ingredient and mixed. It's very good when eaten chilled and makes for a great breakfast with the "slower burn" of oats (fiber, harder to digest so it takes longer and produces energy for longer) vs a "fast burn" breakfast like sugary cereal (which digest fast and makes you sleepy and hungry after a while).